Come to Gerola Alta to taste the king of cheeses from Valtellina! If you take a bus you can reach Gerola Alta on the river Bitto, which names the famous cheese. The word Bitto comes from the celtic word bitu, and this says a lot about who passed through here in ancient times! The Bitto is the king of cheeses, his worship, his majesty! And if you come here you cannot go wrong… There is Via Bitto, Hotel Bitto, what else? Of course, The Bitto museum! It is modern and naturally cooled with an ingenious canals system that end up in the river; therefore the air comes straight from the river and you can even adjust it! The museum is chock full of Bitto wheels meticulously preserved for their super long maturation. 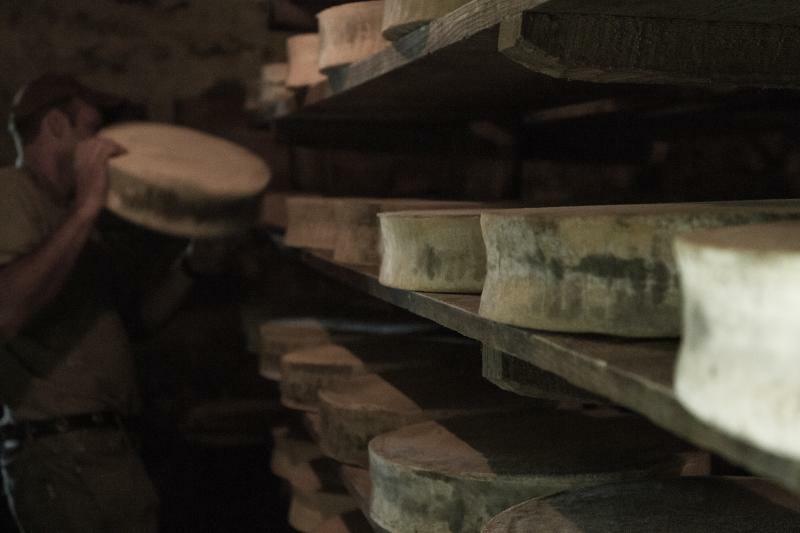 Here the cheese ages for over 10 years and the wheels are beautiful, they’re true works of art, they look like shamanic drums! If there’s something that never changes that is the shape of the Bitto. And there’s a reason for that: ages ago there weren’t streets and cheeses were transported on donkeys backs. The round shape with a concave recess served precisely to facilitate the transportation. For how it is done, for its particular production, for its process of ageing and for the ability of the producers, the Bitto makes Japanese people go crazy, because they have a real cult for the products that are the result of a wise ritual. Indeed they wonder why those artisans, who are able to create one of the greatest product in the world, aren’t called Masters! Like master cheese-maker Enrico Colli, who tells me how the Bitto is made in the mountains: the master cheesemakers go to the mountain pastures from June to October, where cows can graze munching on the fresh summer grass. Also the goats are brought to the mountains, goats with long horns, of a very special breed. In those days the cheesemaker lives alone in a pasture calécc, a structure made out of rock that creates a fairly enclosed environment, but not completely closed. On top of it there is a cloth, it looks more like a tent than a shed. But why all this? To quickly turn the cow milk in this wonderful cheese. For centuries the Calèccs have been the travelling workshop of these artisans of the mountains. We can imagine how the life of the cheesemakers is during the months in mountain pastures, certainly very solitary and nomadic. They stay in the same place only for 3 or 4 days, then they move to ensure always fresh grass to the herd. The Bitto is made with fresh milk, and the taste and aroma of the Bitto remind a little bit of the grass the cow’s just eaten! I understand well how this work also has an important ecological aspect, a pasture and landscape conservation aspect. In the mountain pasture they work from 4 am till 11 pm, for 5 or 6 months! They becomes actual hermits, that’s why I asked Enrico what he feels when he comes down from it? He answered that he liked to be alone, and when he comes back to the valley he has some difficulty in returning to the society. He needs a few days and needs to meet one person at a time, not all at once! So producing the Bitto implies adopting a lifestyle in contact with nature that many young people seem to have re-discovered: many of them began to learn the job, also to spend the summer in the mountains, following the shepherds and sleeping in the Calèccs to take a vacation! that gives its name to the famous cheese. The word bitto comes from a Celtic word bitu. We’re in the area where they make it. Can we call Bitto just cheese? His Excellency, his majesty, because it’s the king of cheeses! We see Bitto Street and we see Hotel Bitto, but what else is there? The welcoming party is a living museum about life on the mountain. there’s some salt for the animals and some objects made out of soapstone. This is used to hold the phone, to call people when it’s time to eat. The fascera (mould) was used to hold the cheese, giving it its characteristic shape. It’s enormous, big enough to hold 35kg of Bitto. That stool is used for milking. and mountain pastures to make the Bitto. These cheeses are really beautiful, like works of art! They look like Shamanic drums. I’d never heard them described like that before! …At this point I imagine they can also be played. where the cheese ages and keeps for more than 10 years. like this grille, the wettest, that goes down as far as two metres. There are a series of channels with a central pipe that ends up in the Bitto river. The air comes directly from the river and it can even be adjusted! But if there’s one thing that never changes it’s the Bitto’s shape. I realise that now seeing all these hanging cheeses. Before the advent of roads the Bitto was carried on the backs of mules. This form with this concave bump helped with its transportation. it’s also possible to write dedications on the cheeses, in blueberry ink! And add a drawing too. “Sestino, you’ll always be our star”. They order them from New Zealand and from Germany, for example. The Japanese asked me: why do you call your herdsmen “farmers”? Anyone who makes one of the greatest products in the world ought to be called a “master”! where to display and sell the typical product. All of these, for example, were made by master cheese maker Enrico Colli. The master cheese makers go up to the mountain pastures from June to October. And it’s not just the cows that are taken to the higher altitudes, the goats are as well. I wonder if they’re Celtic as well. for immediately transforming the cows’ milk into this wonderful cheese. The calècc has been a travelling factory for these mountain artisans for centuries. A vertical transhumance of the animals! so as not to let the milk go to waste. Bitto is made from fresh milk that has just come from the cow. The time spent in one place on the mountain pasture is brief and then it’s time to move on. There’s also an environmental aspect of wanting to preserve the pasture. The animals eat just the right quantity of grass, without excessively trampling the pasture. But never leaving behind any grass that would grow wild and become shrub. Life on the mountains means working from 4 in the morning ‘till 11 at night, for 5 or 6 months. We become like hermits! It takes passion. Perhaps this is a life choice. But is it lovely or not? How do you feel when you come back down? I like being on my own or with just a few others, so when I come down I find that slotting into society again is difficult. I have to see one person at a time, not all of them together! and that many young people appear to have rediscovered.